Context: Anatomical and visual outcomes of phacoemulsification and 23-gauge (23G) pars plana vitrectomy (PPV) assisted with perfluorocarbon liquid (PFCL) and 27-gauge twin-chandelier endoillumination for primary rhegmatogenous retinal detachment (RRD). Aims: This study aims to determine the anatomical and visual outcomes of phacoemulsification and 23G PPV for primary RRD assisted with 27-gauge (27G) transconjunctival twin-chandelier endoillumination and bimanual vitreous base shaving under PFCL. Settings and Design: A prospective single tertiary center cohort study of 65 consecutive eyes by a single surgeon between August 2013 and June 2014. Subjects and Methods: The primary outcome measure was the primary retinal reattachment rate. The secondary outcome measure was best-corrected visual acuity (BCVA). All patients were reviewed postoperatively up to 4 months. Statistical Analysis Used: Chi-squared, Student's t-test, and one-way ANOVA test were used in this study. Results: At 4 months, overall retinal reattachment was 83.1% with a single operation and 87.7% with a second surgery. After exclusion of the proliferative vitreoretinopathy (PVR) cases, the primary retinal reattachment rate improved to 93.9% and secondary retinal reattachment rate was 98.0%. The mean BCVA improved from logMAR 1.06–0.83 (P = 0.002). 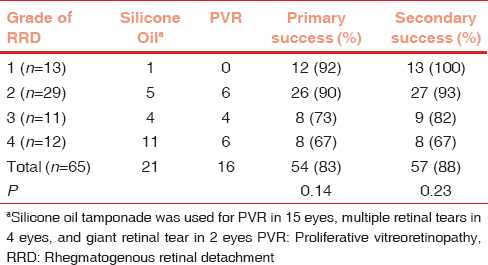 PVR (P = 0.0001), silicone oil tamponade (P = 0.002), macula-off RD (P = 0.12), location of RRD (P = 0.09), and delay of more than 7 days for surgery (P = 0.09) were associated with a higher redetachment rate. The main postoperative complications were small bubbles of PFCL in the posterior segment (18.5%) and subretinal PFCL (3.1%). Conclusions: Chandelier endoillumination and PFCL-assisted 23G PPV with phacoemulsification has reattachment rates and visual outcomes similar to the current standard of RRD repair of different complexities. This surgical technique can be considered an alternative method of repairing RRD, with some advantages. Since Robert Machemer introduced pars plana vitrectomy (PPV) to repair rhegmatogenous retinal detachment (RRD) in 1970, surgical techniques have evolved over the years. Chandelier endoillumination has been used as it provides panaromic endoillumination leaving both hands free to perform bimanual surgery. Despite the advances in chandelier endoillumination, there has been no published evidence on whether it provides any advantage in repairing RRD. Perfluorocarbon liquid (PFCL) has also been used in RD surgery to flatten and stabilize detached retina thereby allowing for close vitreous base shaving and to displace subretinal fluid anteriorly through retinal breaks thereby eliminating the need to create a posterior drainage retinotomy., This prospective study was conducted to evaluate the anatomical and functional outcomes of repairing primary RRD with the assistance of both chandelier endoillumination and PFCL. This is a prospective interventional case series in a tertiary center in the UK. Ethics committee approval was obtained and the study was also registered with the clinical audit department at the local hospital center. The research adhered to the tenets of the Declaration of Helsinki and all patient data were anonymized during extraction for analysis. Data analysis of 65 consecutive patients (65 eyes) who underwent 23-gauge (23G) PPV for primary RRD between August 2013 and June 2014 was conducted. All cases were performed by a single senior vitreoretinal surgeon (PRC). Patient demographics, preoperative and postoperative examinations including best-corrected visual acuity (BCVA), presenting symptoms, associated ocular disease, lens status, grade of RRD, macular involvement, and postoperative complications were analyzed. Anatomical success was defined as stable retinal reattachment at 4 months postoperatively. Patients were reviewed at 1 day, 2 weeks, 1 month, 2 months, and 4 months following surgery. Statistical analysis was performed using Excel Professional Plus 2010 (Microsoft Corporation, Washington, USA), with Chi-squared, Student t-test, and one-way ANOVA test where appropriate. Statistical significance was defined as P < 0.05 for all tests. After informed consent was obtained, the patients underwent either subtenon local anesthesia or general anesthesia. All phakic patients had phacoemulsification and lens implantation into the capsular bag. Three standard 23G PPV ports were inserted transconjunctivally. The 27G twin-chandelier (DORC) was then inserted superiorly 3.5 mm from the limbus transconjunctivally. The Resight 700 (Zeiss, Oberkochen, Germany) was used as the viewing system. The vitrectomy system (DORC, Zuidland, Holland) was used with a cutting rate of 6000/min and suction rate ranging from 120 to 400 ml/min. After core vitrectomy, PFCL (FCI, Paris, France) was injected up to the posterior edge of the retinal tears. Peripheral vitreous shaving was done under PFCL posterior to the retinal breaks. Endodiathermy was used to localize the retinal tears. PFCL was further injected up to the level of the ora serrata to allow flattening of the retina and close bimanual vitreous base shaving with indentation. Endolaser photocoagulation of the retinal tears was then performed using bimanual indentation under chandelier endoillumination. PFCL-air exchange was performed with simultaneous aspiration of the subretinal fluid through the retinal breaks. Internal drainage of subretinal fluid through the anterior retinal tears was aided by bimanual indentation. Air–gas 17.5% hexafluoroethane (C2F6) or silicone oil (1000 Cs) exchange was performed. Patients were advised appropriate posturing for 5 days. A total of 65 eyes of 65 patients (41 males, 25 females) with a mean age of 60.2 years were treated. The macula was attached in 25 eyes (macula on) and detached (macula off) in 40 eyes [Table 1]. The retinal breaks were U-tears in 62 eyes, giant retinal tears in 2 eyes, and 1 eye with outer leaf break in retinoschisis RRD. Proliferative vitreoretinopathy (PVR) was present in 16 eyes and was categorized according to the Retina Society PVR classification and consisted of Grade A (5 eyes), Grade B (4 eyes), Grade CA (anterior) (1 eye), and Grade CP (posterior) (6 eyes). Grade 4 is any complex break (including giant tears or extensive PVR) or detachment not covered by the above. 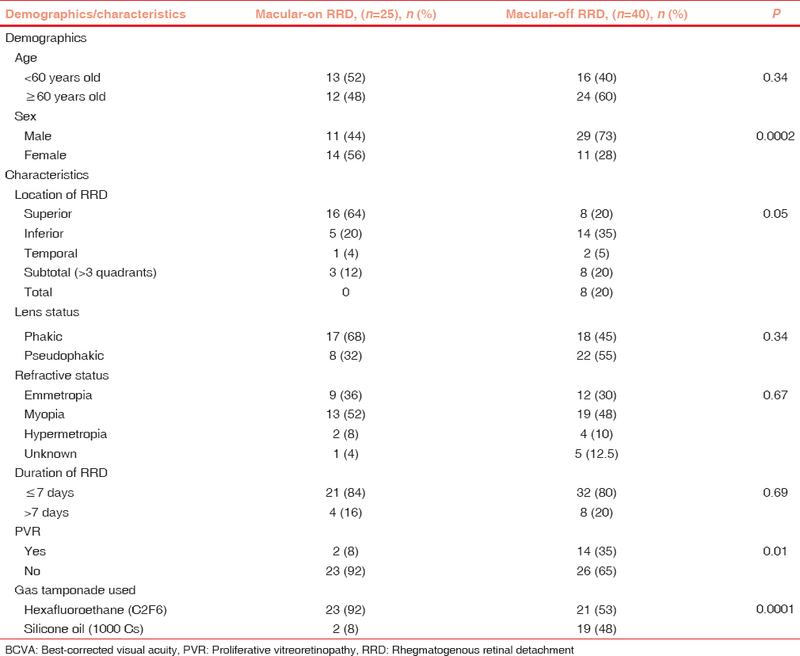 [Table 2] describes the association of the success rate of reattachment of the RRD with the grade of RRD. Retinal reattachment was achieved in 83% of all cases with a single operation and in 88% with a second operation. When the PVR cases were excluded, the final primary retinal reattachment rate improved to 94% and the secondary retinal reattachment rate was 98%. Mean BCVA improved from LogMAR 1.06–0.83 (P = 0.002, paired t-test). Further risk factor stratification and association with the final visual outcome and redetachment rates are described in [Table 3]. Published studies have reported primary anatomic success rates between 80% and 92% for 23G surgery.,, In our study, we have shown a primary surgical success rate of 94% with a single operation in cases without PVR and an overall primary success rate of 83% for all cases. Our study also demonstrated that the presence of PVR was an important prognostic factor in our final anatomical and visual outcome. When PVR was not present, the primary redetachment rate was 6%, but when PVR was present that rate increased to 50%. Mikhail et al. retrospective case series of 212 cases also showed the presence of PVR negatively affected their primary success rate. Other published literature have also shown statistically significant development of PVR led to a 72.53 times greater likelihood of RRD redetachment and a relative risk ratio of 1.46. We have also shown that the anatomic success rate worsened with increasing grade (complexity) of the RRD, but this did not reach statistical significance. The effect of symptom duration until surgery of >7 days in our cohort of patients showed a higher rate of redetachment. These patients presented with macular-off RRD which is similar to Enders et al. findings that macular off RRD had significantly higher redetachment rates. BCVA was worse in the PVR cases and more common in eyes presenting with macular-off RRD. However, statistically significant determinants of better BCVA outcome were macula on RRD and superior RRD. The improvement in visual acuity in our study was also comparable to the UK National Ophthalmology Database of 3403 eyes which reported a mean improvement of vision from LogMAR 1.0 to 0.5 over 6 months. It was also worthy to note that in our study, the anatomical and visual outcomes were similar in the phakic and pseudophakic patients. These findings allay concerns about causing inflammation and redetachment in combined cataract surgery and PPV for RRD. The surgical technique used in our study was based on Professor Claus Eckardt's surgical technique. Phacoemulsification of the lens with intraocular lens implantation was routinely carried out in all phakic eyes. This allowed easier access to the peripheral fundus for closer vitreous shaving. Chandelier endoillumination was used to allow bimanual surgery and to allow better visualization of the peripheral retina and easy identification of all retinal tears. Cryotherapy was avoided and endolaser photocoagulation of retinal tears facilitated by bimanual indentation was preferred. The use of PFCL facilitated drainage of subretinal fluid through the peripheral tears, thus avoiding creating a posterior drainage retinotomy. This technique differs from the standard technique of RD repair performed in the UK which rarely uses PFCL. The presence of PFCL posterior to tears also prevented the tracking of subretinal fluid toward the posterior pole. One of the feared complications of using PFCL in retinal surgery is subretinal or submacular PFCL. Our study had only 1 case of subretinal PFCL. This is within the reported incidence of 1%–11%., Besides that, there was no evidence of the formation of macular hole from persistent subretinal PFCL as reported by Ehlers et al. Chandelier endoillumination has gained popularity because of its wide field of visualization and allowing the use of bimanual surgical techniques. A reported complication of endoillumination is retinal photoxicity, but this is proposed to be at a lower risk with chandelier endoillumination due to the increased distance of the probe tip from the retinal surface., Other complications are postoperative hypotony, endophthalmitis, leakage of vitreous, gas or silicone oil from the sclerotomies, thermal damage to sclerotomies, or deformation of the conical tips of the fibers. None of these severe complications were encountered in our series, but one patient had a small hyphema which quickly cleared postoperatively. Although this study is limited by its relatively small sample size and short follow-up period, it does give an insight into the benefit of combined phacoemulsification and vitrectomy with 27-gauge transconjunctival twin-light chandelier endoillumination and PFCL in repairing RRD. This study shows that chandelier endoillumination and PFCL-assisted vitrectomy and phacoemulsification is an option in improving the efficacy and efficiency of repairing all types of RRD by allowing close vitreous base shaving, easy localization of retinal tears and delivery of endolaser using a bimanual technique. The results of this surgical technique have achieved anatomical and visual outcomes in keeping with published data. However, further randomized controlled studies with a larger patient sample, comparing subgroups of RRD, and longer follow-up would be useful to establish the efficacy and efficiency of this surgical technique. Machemer R, Buettner H, Norton EW, Parel JM. Vitrectomy: A pars plana approach. Trans Am Acad Ophthalmol Otolaryngol 1971;75:813-20. Stolba U, Binder S, Velikay M, Datlinger P, Wedrich A. 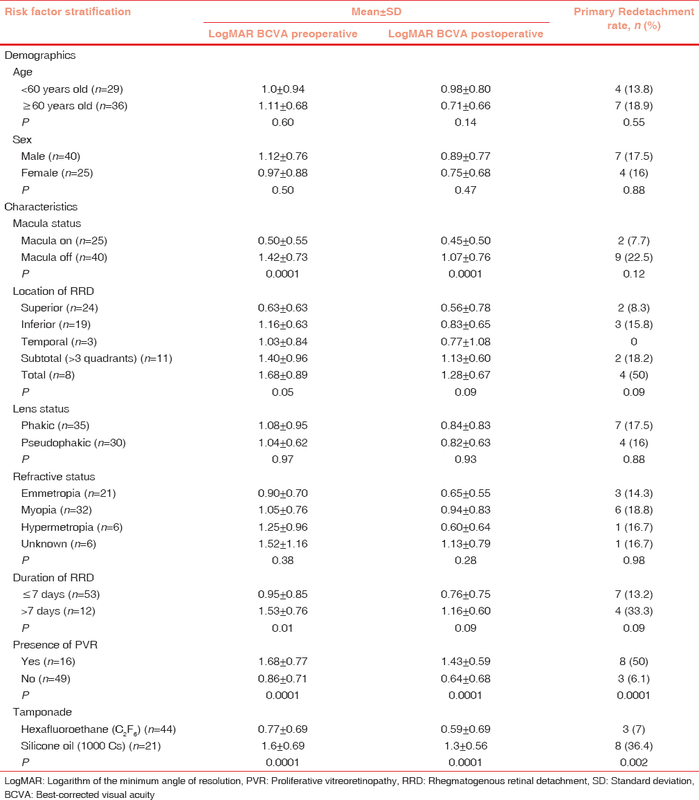 Use of perfluorocarbon liquids in proliferative vitreoretinopathy: Results and complications. Br J Ophthalmol 1995;79:1106-10. Yu Q, Liu K, Su L, Xia X, Xu X. Perfluorocarbon liquid: Its application in vitreoretinal surgery and related ocular inflammation. Biomed Res Int 2014;2014:250323. Machemer R, Aaberg TM, Freeman HM, Irvine AR, Lean JS, Michels RM, et al. An updated classification of retinal detachment with proliferative vitreoretinopathy. Am J Ophthalmol 1991;112:159-65. Thompson JA, Snead MP, Billington BM, Barrie T, Thompson JR, Sparrow JM, et al. National audit of the outcome of primary surgery for rhegmatogenous retinal detachment. I. Sample and methods. Eye (Lond) 2002;16:766-70. Albrieux M, Rouberol F, Bernheim D, Romanet JP, Chiquet C. Comparative study of 23-gauge vitrectomy versus 20-gauge vitrectomy for the treatment of rhegmatogenous retinal detachment. Graefes Arch Clin Exp Ophthalmol 2011;249:1459-68. Lewis SA, Miller DM, Riemann CD, Foster RE, Petersen MR. Comparison of 20-, 23-, and 25-gauge pars plana vitrectomy in pseudophakic rhegmatogenous retinal detachment repair. Ophthalmic Surg Lasers Imaging 2011;42:107-13. Tsang CW, Cheung BT, Lam RF, Lee GK, Yuen CY, Lai TY, et al. Primary 23-gauge transconjunctival sutureless vitrectomy for rhegmatogenous retinal detachment. Retina 2008;28:1075-81. Mikhail MA, Mangioris G, Casalino G, McGimpsey S, Sharkey J, Best R, et al. Outcome of primary rhegmatogenous retinal detachment surgery in a tertiary referral centre in Northern Ireland – A regional study. Ulster Med J 2017;86:15-9. Lindsell LB, Sisk RA, Miller DM, Foster RE, Petersen MR, Riemann CD, et al. Comparison of outcomes: Scleral buckling and pars plana vitrectomy versus vitrectomy alone for primary repair of rhegmatogenous retinal detachment. Clin Ophthalmol 2017;11:47-54. Enders P, Schick T, Schaub F, Kemper C, Fauser S. Risk of multiple recurring retinal detachment after primary rhegmatogenous retinal detachment repair. Retina 2017;37:930-5. Enders P, Schick T, Kemper C, Schaub F, Fauser S. Effect of symptom duration until surgery on first-year outcome in pseudophakic primary rhegmatogenous retinal detachment. Ophthalmologica 2017;237:73-7. Jackson TL, Donachie PH, Sallam A, Sparrow JM, Johnston RL. United Kingdom national ophthalmology database study of vitreoretinal surgery: Report 3, retinal detachment. Ophthalmology 2014;121:643-8. Eckardt C. Transconjunctival sutureless 23-gauge vitrectomy. Retina 2005;25:208-11. Bourke RD, Simpson RN, Cooling RJ, Sparrow JR. The stability of perfluoro-N-octane during vitreoretinal procedures. Arch Ophthalmol 1996;114:537-44. Garcia-Valenzuela E, Ito Y, Abrams GW. Risk factors for retention of subretinal perfluorocarbon liquid in vitreoretinal surgery. Retina 2004;24:746-52. Ehlers JP, Ohr MP, Kaiser PK, Srivastava SK. Novel microarchitectural dynamics in rhegmatogenous retinal detachments identified with intraoperative optical coherence tomography. Retina 2013;33:1428-34. Charles S. Illumination and phototoxicity issues in vitreoretinal surgery. Retina 2008;28:1-4.
van den Biesen PR, Berenschot T, Verdaasdonk RM, van Weelden H, van Norren D. Endoillumination during vitrectomy and phototoxicity thresholds. Br J Ophthalmol 2000;84:1372-5. Eckardt C, Eckert T, Eckardt U 27-gauge twinlight chandelier illumination system for bimanual transconjunctival vitrectomy. Retina 2008;28:518-9.